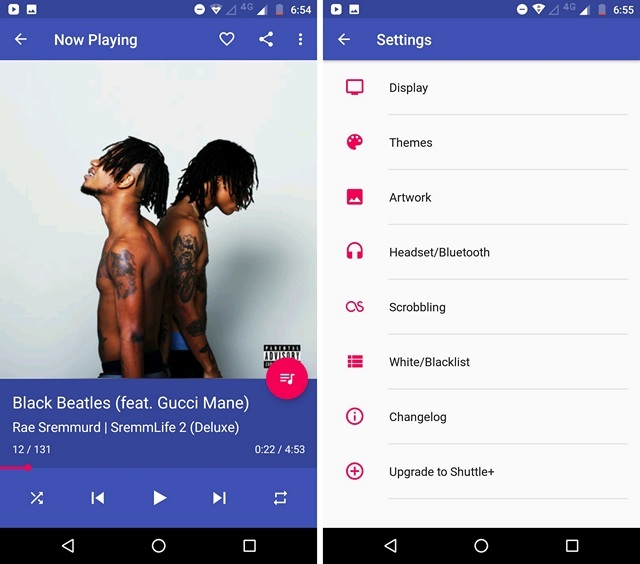 GoneMAD Music Player might not be as popular as some other music players on this list but it’s certainly one of the best music players on Android. GoneMAD offers a sleek and fast experience and packs in a ton of features. All of that in a good-looking and uncluttered UI. The music player supports almost all music formats, including the likes of aac, flac, adts etc. It packs in various audio effects, that you can fiddle around with to get the desired audio quality. There are 16 built-in equalizer presets, along with the options like DSP limiter, auto pitch correction, gain & audio balance control, and more. Other than that, the app includes features like gapless playback, sleep timer, crossfade, cuesheet, tag editing, smart playlists and lyrics apps. Apart from the music playback options, everyone wants a good-looking music player and this is where GoneMAD’s various customization options come into play. The app packs in more than 250 customization options. You can choose from various Material Design and Holo themes, or choose from more than 1000 themes. Then, there are options to re-order the tabs in the app, along with various other customization options. 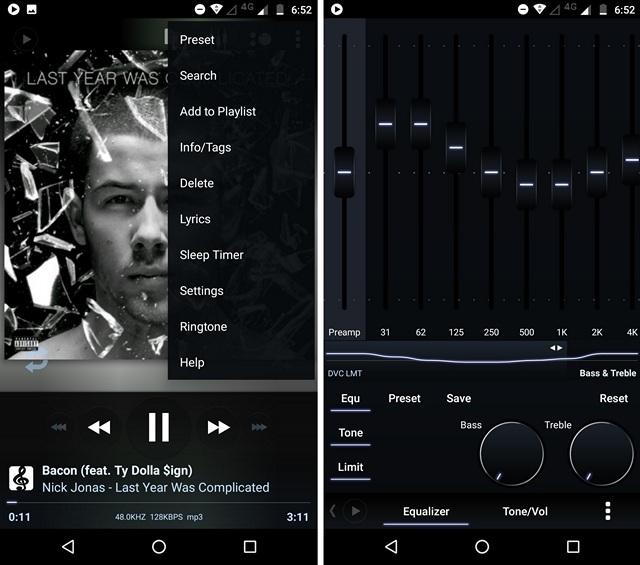 If you have been using an Android device for a while, you must have heard of Poweramp. 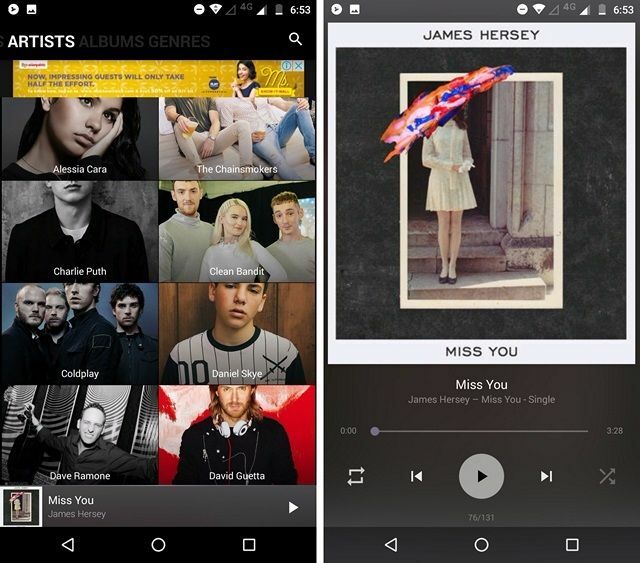 The Poweramp music player app is one of the most popular music players on Android, if not the most popular. While the interface might seem complex to some, the solid feature list more than makes up for it. Poweramp supports almost all the different playlist formats and music formats you can think of, like alac, flac, wma, wav, ogg, m3u, pls etc. The music player packs in a ton of audio enhancement features like, 10 band optimized graphical equalizer, Bass and Treble adjustment, stereo eXpansion, mono mixing, balance, and more. The music player also supports gapless playback, crossfade, replay gain, dynamic gain, lyrics, .cue files, Last.fm scrobbling, tag editor, and way more. Along with the ton of features, the settings page of Poweramp is filled with different options you can play with. 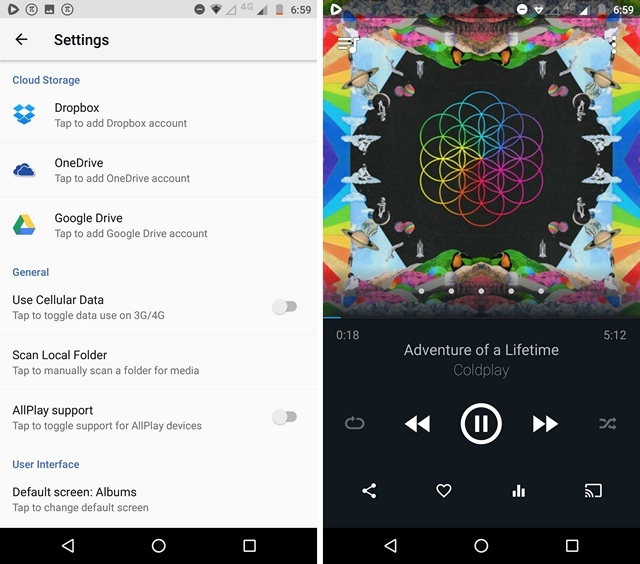 There are options to customize the look & feel of the app, album art, audio, lock screen, and more. To sum things up, if you want the most powerful music player on your Android smartphone or tablet, you should get the Poweramp music player. The app is available for a free trial of 14 days, after which you will have to purchase the full version. BlackPlayer is one of my favorite music player apps out there, all thanks to its perfect balance of features and UI. The app looks amazing, thanks to its dark & minimal theme, tabbed layout and sleek transitions. Plus, you can customize everything. You can change styling of the colors, font, animations and you can change how the now playing page or the sliding menu looks. When it comes to the features, the app supports most standard formats including the likes of flac. BlackPlayer comes with a built-in equalizer, but you can choose to use an external equalizer. The app also supports bassboost & 3D surround virtualizer, gapless playback, ID3 tag editor, sleep timer, crossfading and ability to view and edit embedded lyrics. Plus, there are some really cool looking widgets you can use to control playback on the go. BlackPlayer is available in a free version but its features are a bit limited. While you can unlock some features by enabling ads in the app, you will have to purchase the Blackplayer EX app to unlock all features. Another music player you can consider for your musical needs is the Pi Music Player. The app offers a UI that will surely get you interested. It looks gorgeous and the transitions are pure eye candy. When it comes to audio playback features, it includes a built-in 5 Band equalizer with bass boost, 10 amazing presets, virtualizer and 3D reverb effects. Moreover, there are features like sleep timer, enhanced folder view, gesture support, ability to edit metadata, various themes, and more. Along with some powerful music player capabilities and a beautiful UI, the app brings some unique features that make it stand out in the crowd. 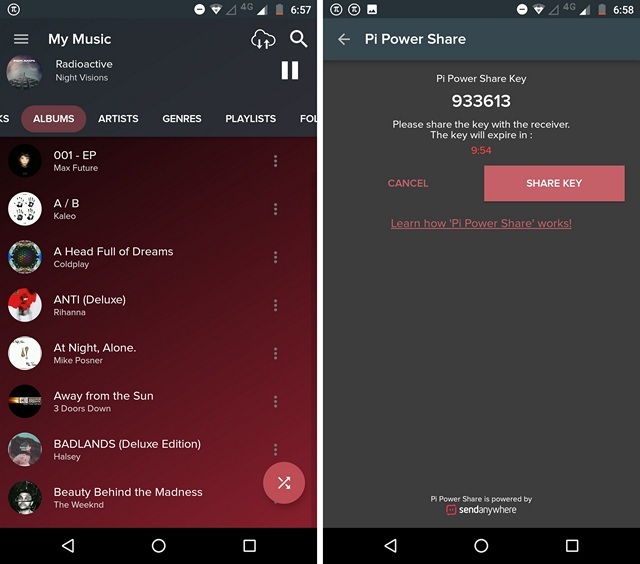 There’s a ringtone cutter and a Pi Power Share feature, that is a cross platform service to share music tracks with others. Pi is available in a free ad-supported version but you can make an in-app purchase to remove ads. Phonograph Music Player is a fairly new yet popular music player out there, thanks to its eye candy and simplicity. The developers behind the app say that it’s “probably the best looking music player out there” and well, they are right. The interface is gorgeous, especially the now playing screen. Plus, you can customize the start page, theme, the colors, appearance of the album covers, and more. It packs in the features too, like gapless playback, equalizer, Last.fm support for scrobbling, tag editor, sleep timer etc. 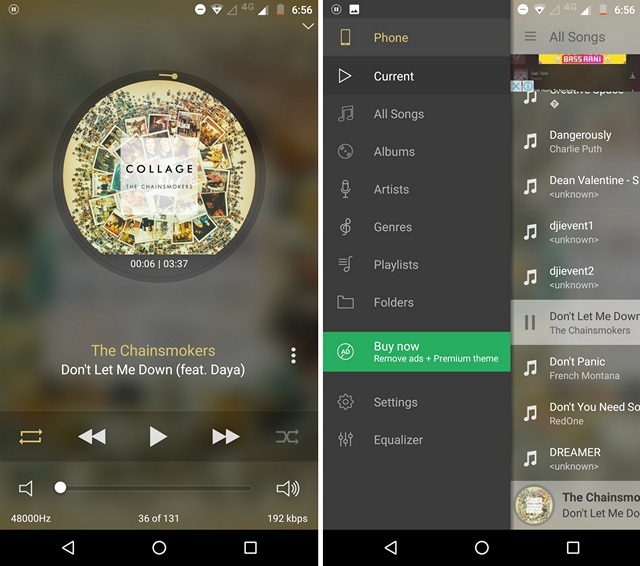 Phonograph Music Player is for people who are looking for an uncomplicated music player with all the basic features and an interface filled with eye candy. The app is available for free but if you like it, you can support the development of the app via in-app purchases. The best thing about the Stellio Music Player is the fact that the app theme changes based on the album art color. Yes, so whenever a track changes, so does the theme of the app, depending on the cover art color. Sounds cool, right? The app is also packed with features, like crossfade, gapless playback, tag editing, scrobbling etc. Along with the standard audio formats, Stellio supports lossless rare formats. It also packs in a 12-band equalizer and 13 audio effects such as VolumeAmp, Balance, Reverb, Flanger, AGC, Z-Bass, Z-Treble etc. There are a lot more options and the music player supports playback control from Android Wear watches, so if you are looking for that, Stellio is the perfect music player for you. The app is available in a free ad-enabled version but you can get the ad-free Premium version, which also unlocks some cool themes. If you are looking to play music stored in your Dropbox, Google Drive or OneDrive account, the CloudPlayer by doubleTwist is the app to get. You can either stream or download music from your cloud accounts with CloudPlayer. Along with great cloud playlist backup & sync, the app brings some really cool features, like Chromecast & AirPlay support, hi-fidelity lossless formats (flac and alac) support, and more. The app also includes a 10-band equalizer with 17 presets & amp and the SuperSound feature, which lets you set headphone enhancements, bass boost, and widening effects. Lastly, the app comes with various customization options and support for Android Auto and Android Wear. The basic features of CloudPlayer are available for free but most of the important features are available in the Premium version of the app. You can get a free trial of the Premium version for 30-days by logging in your Google account or you can just make an in-app purchase. 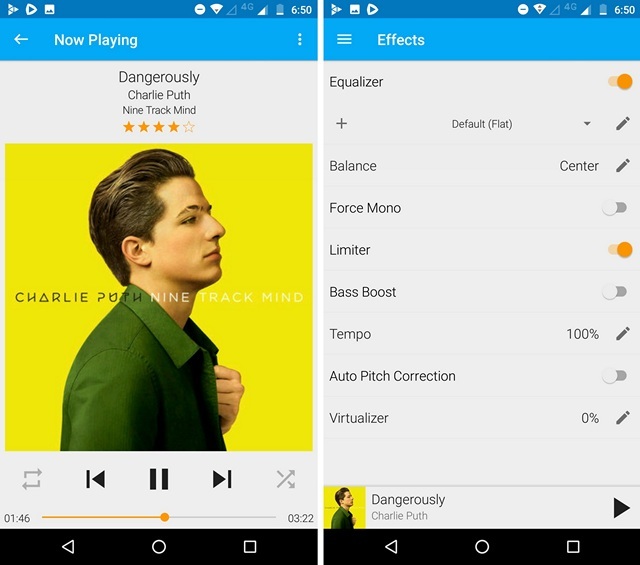 doubleTwist also offers a free music player app, simply dubbed doubleTwist Music Player, which brings all the features of the CloudPlayer sans the cloud storage support, so you can check that out as well. The Minima music player is a new music player, developed by the folks over at XDA and it’s awesome. 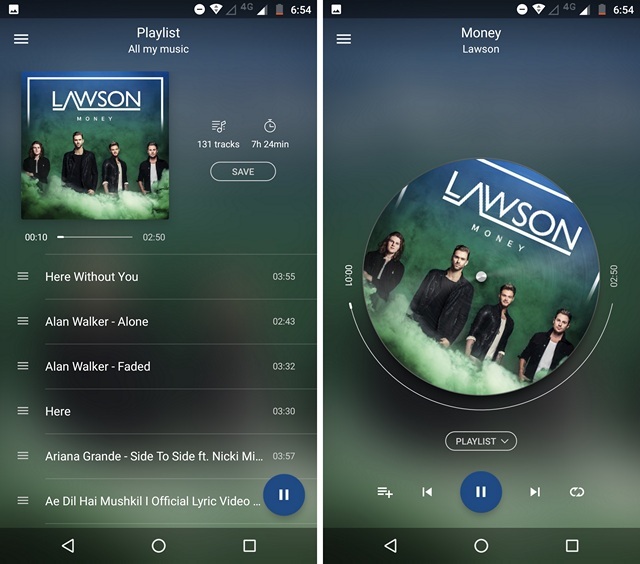 The music player is a bit lacking when you compare it to other powerful music players but you should still take a look because of the fresh experience it offers. The app opens up with a coverflow UI, which brings you different categories like all the music, albums, genres, playlists, etc. Every category has a gorgeous looking UI, with a mix of Material Design and other UI elements. The Now Playing page deserves a special mention though, because the ring design just looks amazing. On the features front, there’s sleep timer, swipe to close player, various customization options and more. As you must have noticed, Minima is still a budding music player but if you can live with that, you get a awesome-looking music player. Minima music player is available for free and the developers have promised new features in regular updates, so you can give it a try. Shuttle Music Player is another very popular music player which deserves your attention. 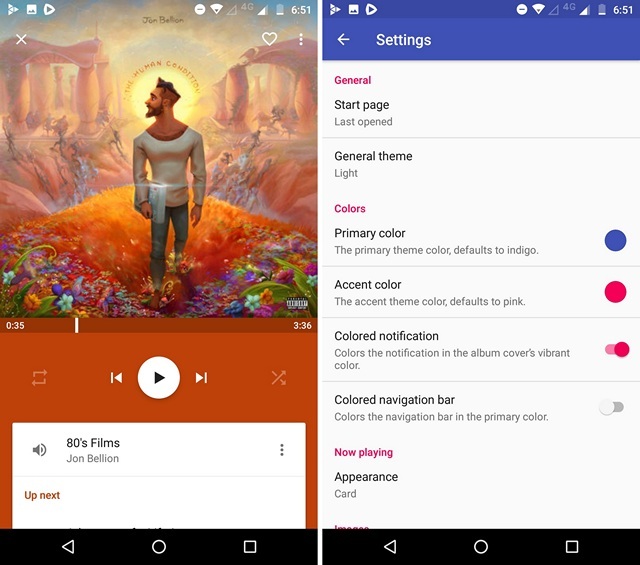 The Material Design featuring music player can be termed as a better version of Google Play Music. The app features a simple yet appealing interface, that obviously can be customized to the hilt with themes. It includes support for gapless playback, embedded lyrics, sleep timer, scrobbling etc. and also features a built-in 6-band equalizer with bass boost. Shuttle is available in a free version but its paid Shuttle+ version brings features like Chromecast support, ID3 tag editing, folder browsing and extra themes. Well, Shuttle music player offers a great balance between an intuitive and useful features, which makes it worth a shot. Having said that, the developers have apparently stopped working on updates to Shuttle, which might not go down well with some, especially after you pay for Shuttle+. The Pulsar Music Player has managed to gain a lot of traction, thanks to the app being lightweight and intuitive. The music player features a clean UI that follows the Material Design UI language and packs in some really cool transitions. You can customize the interface further with some cool themes. When it comes to the features, the app includes support for gapless playback, embedded lyrics, sleep timer, fast search etc. There’s also a built-in tag editor and the app automatically syncs missing album and artist images. 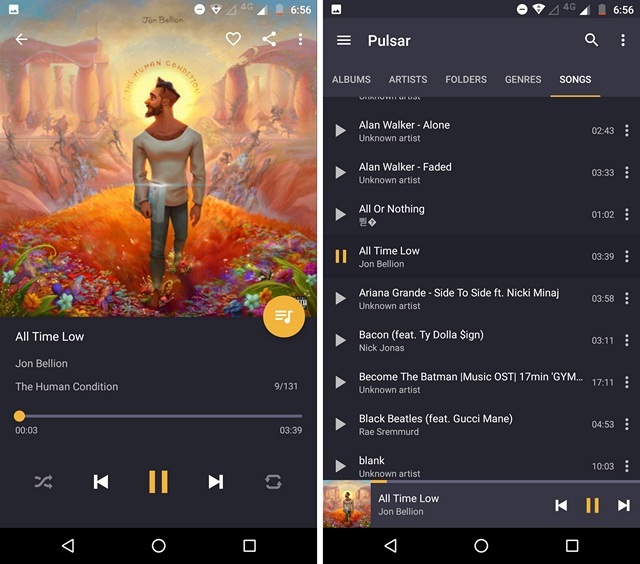 Pulsar Music Player might not be as feature packed as some of the other music players on this list but it gets the most important features just right. Plus, it works flawlessly and is free, so you should definitely give it a shot. Well, that was our list of the best Android music players you can use for all your music needs. We did not include the Google Play Music app because it comes pre-installed on most Android smartphones, and chances are, you are already using it but you are still looking for a replacement. There are other great music players for Android too, like Musixmatch, which brings you lyrics for almost all the songs and floating lyrics for other music apps, PlayerPro, which brings advanced features in a slightly outdated UI. However, the aforementioned music player apps for Android are undoubtedly the best Android music players you can use right now. So, try them out and let us know your about your favorite music player. Also, tell us about any great music players we might have missed out on. Sound off in the comments section below.